It is the dead of winter around here. Strangely, we had two or three gorgeous blue sky days last week. 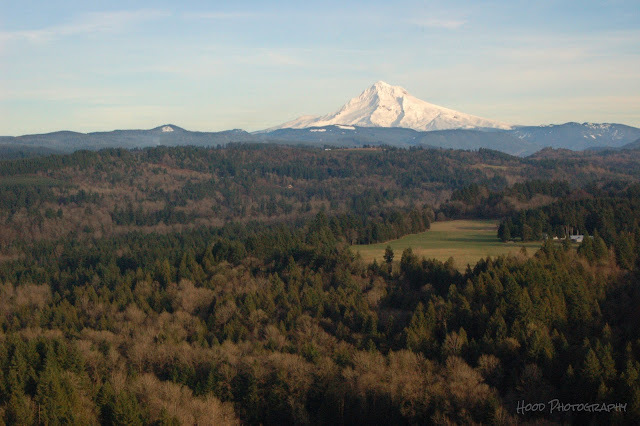 I took advantage of the clear skies to head east and snap this shot of Mt Hood in its whitest wintery glory from Jonsrud Viewpoint in Sandy. a magnificent mountain. a marvelous image. Magnífica...a montanha ao fundo abrilhantou a cena. Um abraço! I love how Mt. Hood juts itself up to the sky so majestically. yes, no snow except the upper elevation! It has been a few years since I've been to Oregon and seen Mt. Hood. I have attended services at Hood View Seventh-Day Adventist Church. Beautiful with the green valley and snowy Mt. Hood in the distance. How scenic...especially for the dead of winter. Nice capture. I love the focal point at the end.